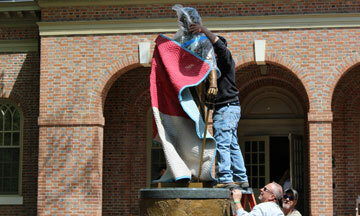 President James Monroe will soon have new life on William & Mary’s campus in the form of a majestic bronze statue. The arrival of the statue, and its official unveiling, will take place on the eve of Monroe’s 257th birthday, which falls on April 28, 2015. Carroll ’62 and Patty ’62 Owens were the impetus behind this memorialization of one of William & Mary’s greatest alumni. The Owenses, who are dedicating their gift of the statue in honor of their class, will be participating in the unveiling ceremony, scheduled at 5 p.m. on April 23 in front of Tucker Hall. James Monroe, the last president who was a founding father of the United States, attended William & Mary until 1776, when he left to fight in the Revolutionary War. Monroe later served as governor of Virginia and held two cabinet positions simultaneously — secretary of war and secretary of state. He served with enormous success as the fifth president of the U.S. from 1817 until 1825. While there are other statues and busts of Monroe, William & Mary’s statue will be unique because of the frieze around its base depicting important milestones in his life. Eight panels show scenes such as Monroe leading the assault at the Battle of Trenton, his extensive experience as diplomat and ambassador, as secretary of war, and as president of the United States. The Monroe Doctrine, a defining moment in the foreign policy of the United States, is caught in the sculpture when it shows Monroe striding forward with his hand shielding the American continents on the globe. “The statue tells the story of James Monroe’s life, and I hope that the students will benefit from that and really feel a sense of pride in their college,” said Patty Owens. The sculptor, Gordon Kray ’73, has worked on several other high profile sculpted monuments, including a bronze portrait of John Paul II and a statue of Pierre L’Enfant, which is located in the National Statuary Hall in the U.S. Capitol. Kray also sculpted statues of Chief Justice John Marshall and George Wythe, both located on the grounds of William & Mary’s campus. The unveiling of the Monroe statue will be the first in a series of celebrations leading up to the 200th anniversary of his presidency in 2017. A so-called “Monroe Renaissance,” spearheaded by former William & Mary Rectors James B. Murray Jr., J.D. ’74, LL.D. ’00 and Jeff B. Trammell ’73, among others, is taking shape to recognize Monroe’s contributions to the nation. More information about the Renaissance will be announced soon. “It is seemly that the Alma Mater of the Nation – James Monroe’s alma mater – take the lead in celebrating our nation’s last founding father,” concluded Reveley.